My mother was coming to visit for two weeks around Chinese New Year. I wanted to take her to some nice places, in particular Taroko Gorge, and the National Palace Museum in Taipei, possibly the largest and most complete collection of Chinese art and historical artifacts in the world. Although public transport would be very crowded and booked up, we could certainly use it to visit the museum. Taroko Gorge would be more of a problem. It would be much easier and our plans could be more flexible if we visited it using our own transport. That meant renting a car, or using my motorbike. A car would be more comfortable but much more difficult to find parking space for and less convenient in the inevitable holiday traffic jams. 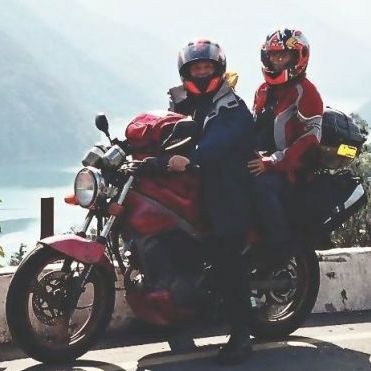 The motorbike would be more flexible and convenient, and in some ways a better way to see the countryside, but would not be as comfortable or safe as a car. I tentatively suggested a motorbike trip to my mother, and was surprised when she said 'OK'. If we were to do Taroko Gorge by motorbike, there was no quick way back to Taichung. I had a week off work for Chinese New Year, so we might as well use the time to do a loop tour around the north, see some interesting places I hadn't seen before either, and in doing so complete the motorbike circuit around Taiwan that Don and I had started the previous July. Don was up for another trip as well, although he was concerned about my mother. "Are you sure that she won't want to go back after a day or two on the bike? ", he asked. In the next couple of weeks, I talked about my plans to Taiwanese friends. Most of them would look at me with horror and say "How can you do that to your mother?" Long-distance, mountain rides were bad enough, but for a mother to be involved? Unconscionable. I phoned mum again and suggested that we rent a car instead. "But I've already bought some boots for going on the motorbike!" she said. "I'm looking forward to it. It should be fun." She was not a complete novice to motorcycling; she had been on the back of my dad's motorbike several times in the 70s. I had bought a protective motorbike jacket and I had a good helmet mum could use.